Update: Due to popular request I’ve included another video of the robot showing actual dish serving and pick up. 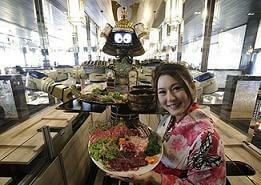 Lapassarad Thanaphant's Hajime restaurant is the first in Bangkok to feature robots. The samura costumed Motoman are waiters. Robots are here to serve you…BBQ! The Hajime restaurant in Bangkok serves shabu-shabu/BBQ and features an entire wait staff composed of nothing but Motoman robots. Owner Lapassarad Thanaphant reportedly spent 30 million baht (~$932,000) on the new restaurant, including her fleet of four humanoid machines. Using a touchscreen visitors can order food or have dirty dishes taken away by the big two-armed bots which are colorfully garbed in samurai costumes. In between requests, the robots dance to entertain their guests and maybe earn a little money on the side. Check out their antics in the video below. I love Motoman robots and all the extraordinary/crazy things they’ve been made to do. Watching one serve dinner makes me wonder how long until they’ll be paired with the robotic chefs we’ve seen to form an entirely mechanical restaurant. The cooking capabilities of these bots is still rather limited, and you should know that in a shabu-shabu style eatery customers heat their own food. Still, there’s nothing quite like having a machine wait on your every culinary whim. As robots become more sophisticated and capable of automating more complex tasks, it will be interesting to see whether or not we’ll see more bots in the kitchen. I love machines, but I love food even more, and I’m not sure I want to give up my “kiss the cook” apron just yet. Keep trying robots…maybe I’ll let you make me a gyro.